How Durable Is Your Standing Desks Surface? We Tested To Find Out. 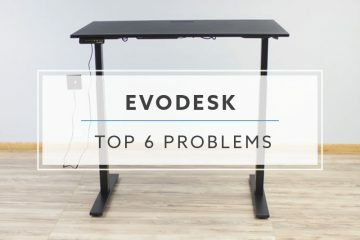 You are at :Home»Buying Tips and Guides»Standing Desk Tips and Guides»How Durable Is Your Standing Desks Surface? We Tested To Find Out. 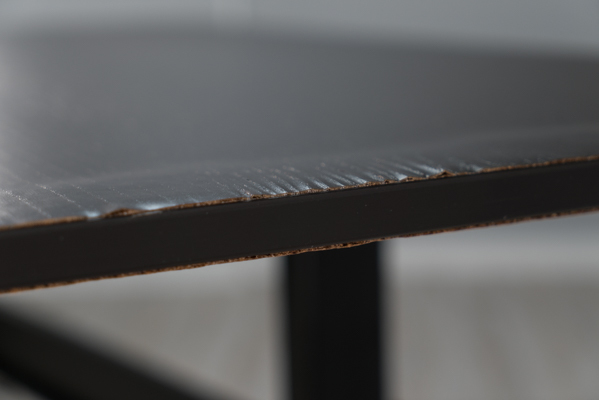 One of the most common questions we get is how durable our standing desk surfaces are. It is typically followed up with how our surfaces compare to various competitors. 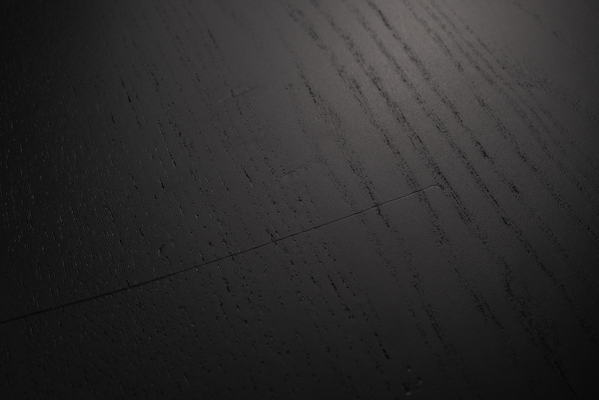 We have found over the years there is a lot of misconceptions about different surface types. Having ordered quite a few competing brands desks over the last 16 months, we’ve had a surplus of surfaces available to test. 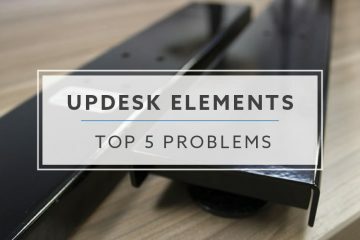 We decided to take the five most popular options and see how they held up using five different durability tests that we created. The tests we did on each could be done by anyone and were not scientific in nature. They were designed to give you a better idea of just how durable these surfaces were for various levels of abuse. Let’s go ahead and take a closer look at our results. 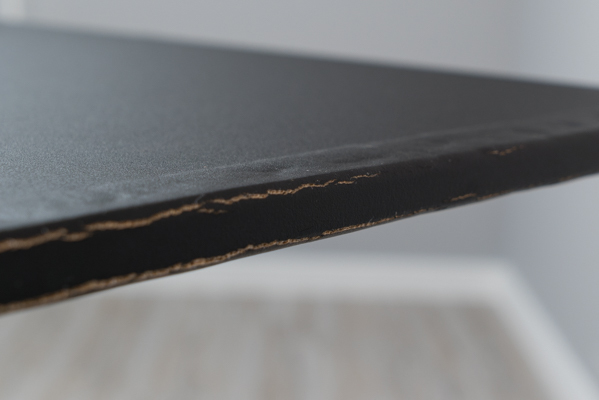 Based on the questions we’ve received over the years, we have compiled six tests that show how durable a surface is. Some of these tests are likely excessive, but we felt they better illustrated the worst case scenarios. 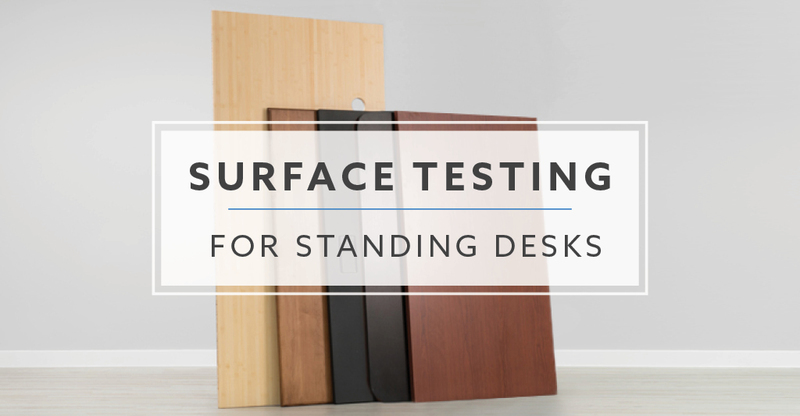 Others, like the short term water test, were more in line with everyday issues standing desk users encounter. These tests are not supposed to be considered scientific and should be used to give you a general idea of how durable a surface will be. The short term water test was pretty straight forward. We took four ounces of water and poured it onto the desk’s surface. We waited exactly 60 seconds from the point the water was poured completely out of the cup. We then wiped the water up and examined the surface for any changes. Our second water test was more extreme and lasted exactly 24 hours. Most won’t submerge their surface in water for 24 hours, but we wanted to see what would happen if we did. With slightly over 1” of water in a large tub, we let one end of each top rest in the water. Halfway through our test at the 12-hour mark we removed all of the tops to examine for any damage. The tops were then placed back into the water. After 24 hours we removed the tops and examined all sides to see how they fared. Pictures were taken to note any damage that had occurred. Our third and final water test is probably the most important. How did these surfaces hold up to condensation from a cup over a period of 24 hours? For this test, we filled plastic solo cups with ice and water. Each was set onto the surface and then we let them rest for exactly 24 hours. After the test, we pulled the cups and took pictures of the results. For the writing test, we wrote the word “TEST” on a single sheet of paper for all five of the surfaces with a pen. The same person wrote the word on all five surfaces and applied a consistent amount of pressure. This would represent worst-case scenarios for writing on the surface of your desk, as there was a good amount of pressure applied. 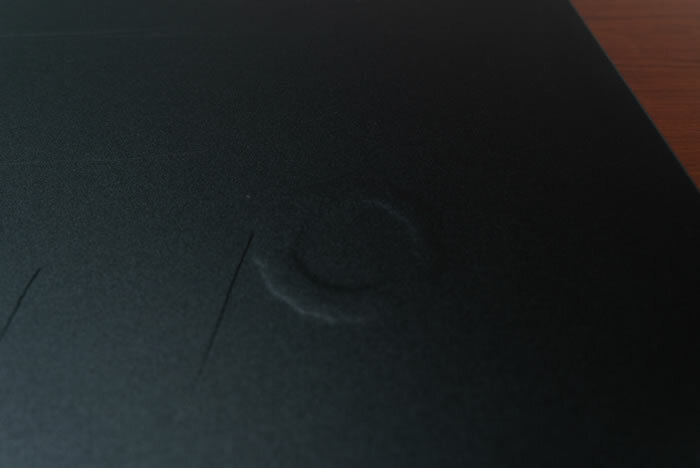 It also used a single sheet of paper, when most users will likely have additional padding from a notebook or notepad. In order to create a consistent scratch, we used a ten-pound dumbbell for our test. We used the same edge and pulled the weight across the surface. This allowed for gravity to create a consistent amount of pressure. The final test we performed was the drop test. This test was done with a 2.5 lb. weight plate. The drop was done from approximately 6” above the surface. We dropped the weight three times to get a better idea of how the surface would hold up to varying impacts from the plate. Each surface type will provide a full written description of the test results and the video of the testing taking place. 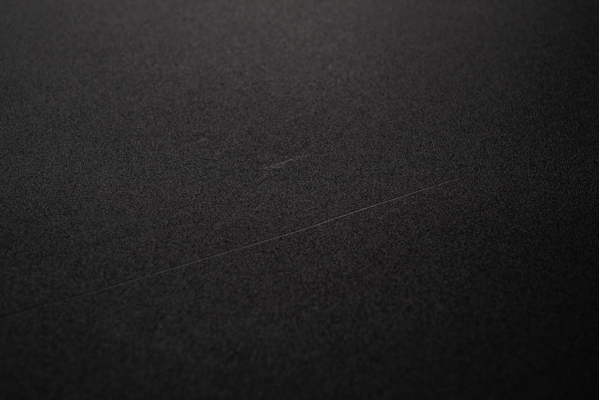 We have also provided still shots for you to see the results of the drop and scratch tests. Because the tops are different styles and colors, they weren’t always easy to show the marks left from our tests with our standard lighting. 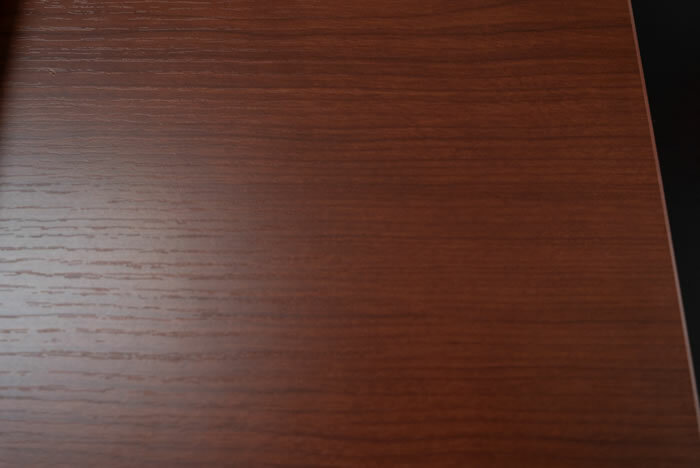 The short term water test for the wood veneer surface went well for the veneer. After wiping up the water there was no permanent damage done to the surface. It’s important to note that all surfaces tested passed this first test. 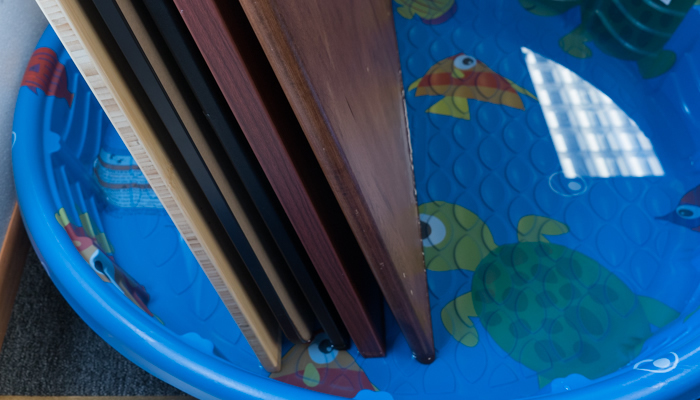 The long term water test was not as successful for the wood veneer surface. Because the surface is not sealed, water was easily able to find its way through the veneer top layer and into the particle board core. Within the first twelve hours, the water had made its way 3” up the surface. There was a large and consistent bubble across the entire top and bottom edge. This bubble started to delaminate the thin veneer layer over the particle board core. After 24 hours, the length of the water damage had made it to 6” max on both sides of the surface. The bubble was fairly consistent on both sides of the surface. The wood veneer layer had started to break apart on the top. 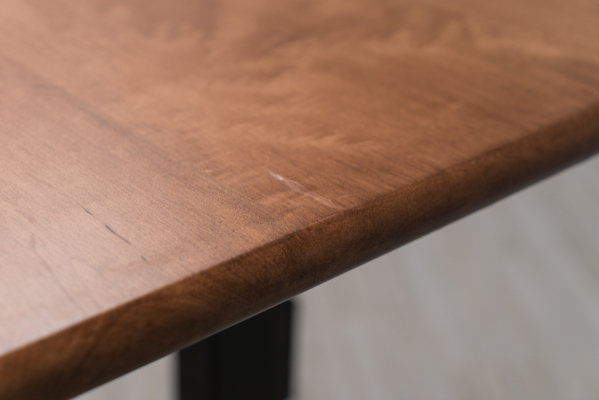 Overall, the wood veneer surface was the worst of the entire group of tops tested for long term water damage. The wood veneer held up well to the 24-hour condensation test. There was no visible damage. The wood veneer is a soft material and that didn’t bode well for the writing test. You could easily see all of the letters written on the surface. Much like the writing test, the scratch test for the wood veneer was a fail. The 10 lb. dumbbell was easily able to leave a consistent gouge while being pulled across the top. 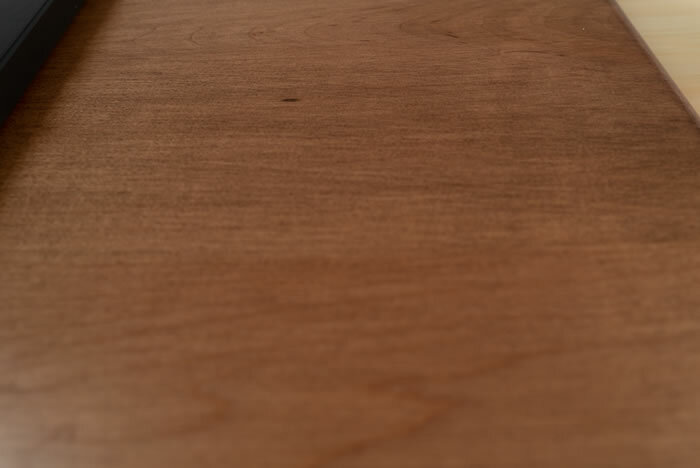 I was surprised to find that the wood veneer held up fairly well to the drop test. Knowing the material was soft; I expected a good size dent. Overall, there were noticeable marks, but it did better than alternatives like the bamboo. The short term water test for the power coated surface went well. After wiping up the water there was no permanent damage done to the surface. It’s important to note all surfaces tested passed this first test. We found that the long term water test for the powder coat was much different than the short term test. This ended up being a close second to worst option for longer term water issues. After twelve hours, there was water damage about 1.5” to 2” on the bottom and top side of the surface. The end of the surface had cracked throughout which was likely due to the expansion of the core materials expanding. After 24 hours the damage looked similar to the first twelve, with the only difference being the thickness of the bulge growing slightly. I believe at this point the surface had stopped absorbing much additional water. 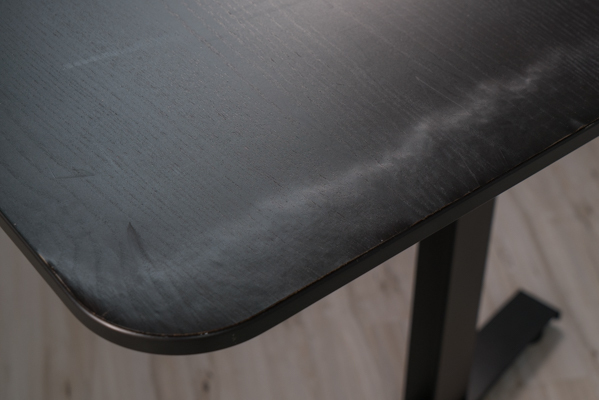 The powder coated surface did not hold up well to the 24-hour condensation test. There was visible damage with a water ring shown below. The writing test for the powder coat surface was the most interesting of the group. 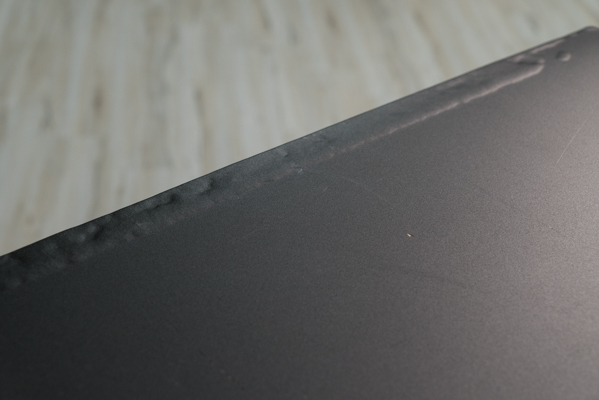 While the surface was rough and felt like it was durable, areas of the surface were more susceptible to writing damage. It’s important we mention this damage was minimal, but it was slightly visible. It was so inconsistent and hard to pick up on the black surface that I would say this shouldn’t be an issue for most users. The power coat top didn’t pass the scratch test. 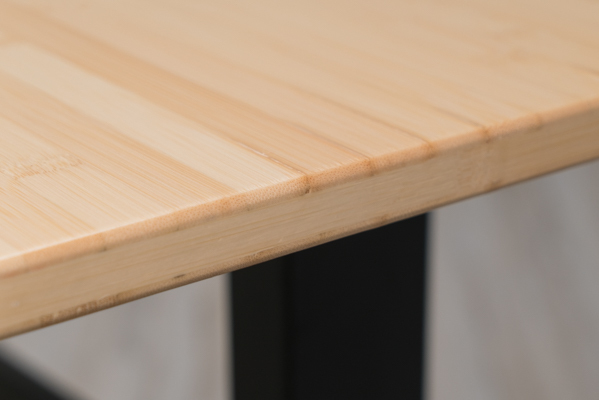 While it performed better than the bamboo and wood veneer, there was still a visible gouge left from the weight. The drop test was successful for the powder coat top. This was a bit of a surprise considering it didn’t do well with the scratch test. As you can see in the pictures, the marks left were minimal. The short term water test for the bamboo surface went well. After wiping up the water there was no permanent damage done to the surface. It’s important to note all surfaces tested passed this first test. The bamboo was the best overall surface for our long term water testing. Honestly, you could have put the surface back on your desk and likely not noticed the change. With only a slight change to the seams where water slowly worked up to 4” up the surface. A fairly faint line appeared that was consistent across the entire surface as well. The bamboo held up well to the 24-hour condensation test. There was no visible damage. Because of the softness with the bamboo, the writing test wasn’t favorable for the bamboo surface. You could easily see the word “TEST” written on the light bamboo surface after the test. 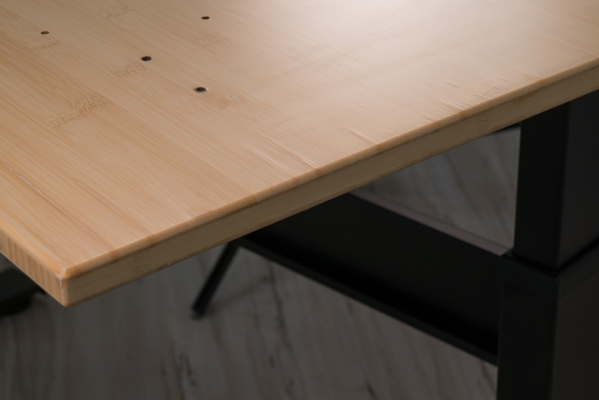 The bamboo was close to the worst option, with only the wood veneer slightly beating them out of the bottom slot. Similar to the writing test, the scratch test wasn’t good for the bamboo either. There was a clear line across the test area after pulling the weight across the surface. This again was very close to the results we found with the wood veneer. 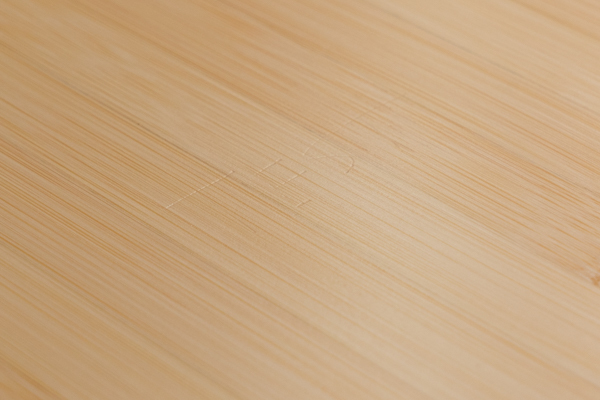 The bamboo didn’t do well in our drop test either, with large gouges from all three drops. 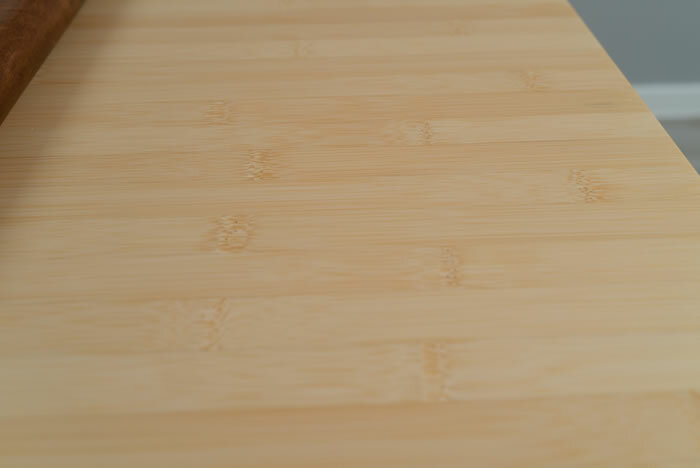 The short term water test for the solid maple surface went well. After wiping up the water there was no permanent damage done to the surface. It’s important to note all surfaces tested passed this first test. The solid maple hardwood did better than expected for the long term testing. 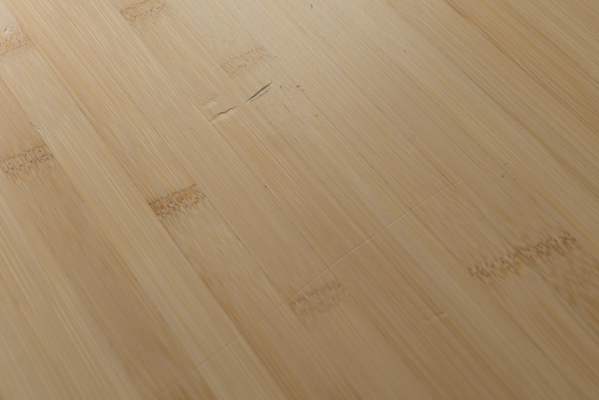 Like the bamboo, users would likely be able to reuse the surface without much of an issue after 24 hours of water damage. The water that got into the surface came through the seam of the boards and slowly worked up the surface. For the most part, these lines were small and hard to notice. There were a few that were more noticeable and they are shown in the picture. The solid hardwood held up well to the 24-hour condensation test. There was no visible damage. 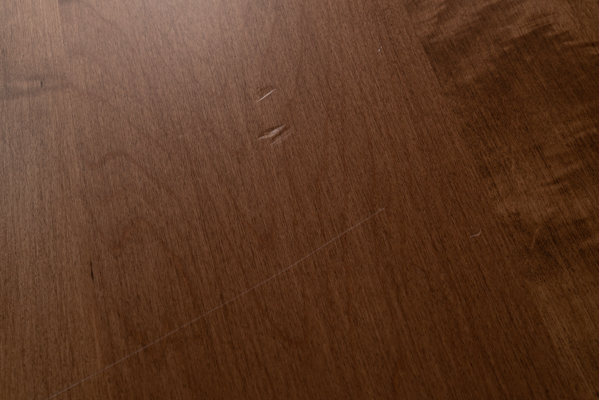 The solid hardwood didn’t pass the writing test, with the word “TEST” visible on the surface. 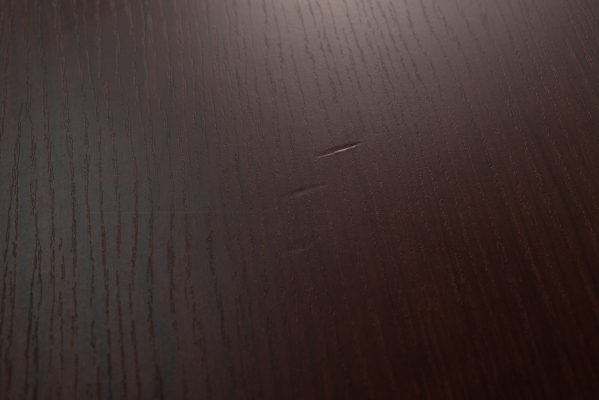 The scratch test for the solid wood left a visible scratch mark. It didn’t leave quite as deep of a gouge as the wood veneer or bamboo surfaces. 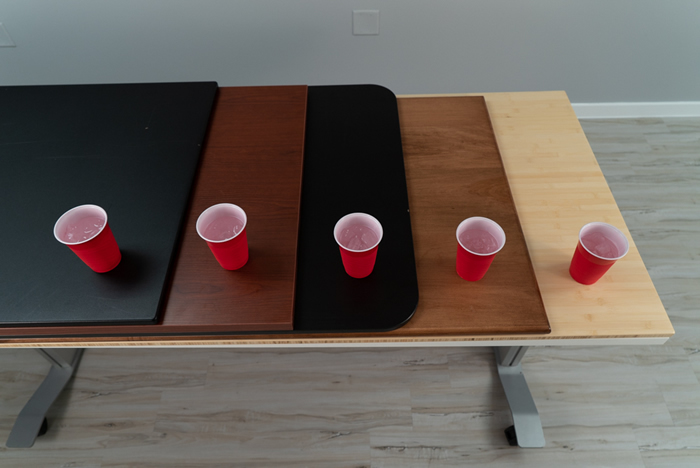 The drop test didn’t go well for the solid wood surface as it showed all three drops. Each was bad with large gouges left behind after each drop. The short term water test for the thermally fused laminate went well. After wiping up the water there was no permanent damage done to the surface. It’s important to note all surfaces tested passed this first test. The long term water test for the thermally fused laminate was a fail. Finding a weakness in the edge, water was able to work its way into the edge banding. After the first twelve hours, the water expansion in the particle board had broken the edge banding seam and water made it about 4” up the surface. After the full 24 hours, the rest of the edge on one side of the surface had broken. The water remained at about 4” up the edge of the surface. By now the surface was still usable, but you could see the bubbling from the particle board expansion underneath the surface. The laminate held up well to the 24-hour condensation test. There was no visible damage. 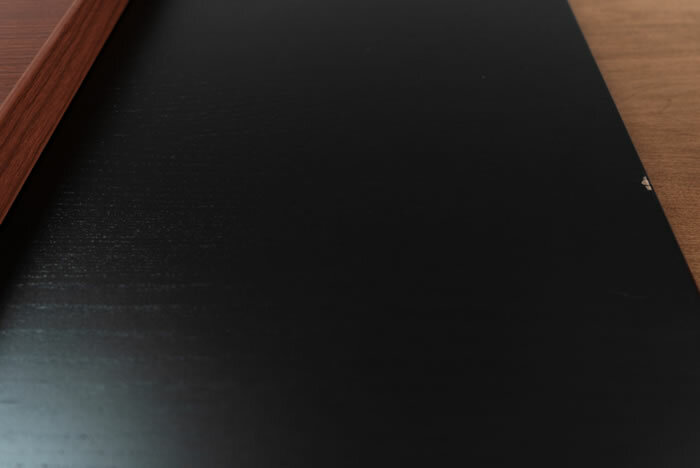 The thermally fused laminate passed the writing test with no marks left after it was completed. 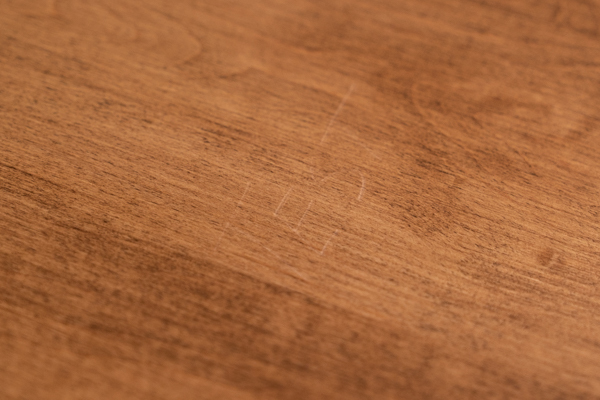 The scratch test was also good for the thermally fused laminate, with a faint line left on the surface of the laminate. The weight didn’t leave a gouge on the surface after being pulled across. The thermally fused laminate did fairly well through the drop testing, with the exception being on the first drop. You can see the deepest gouge was from a side of the plate weight when it was dropped. 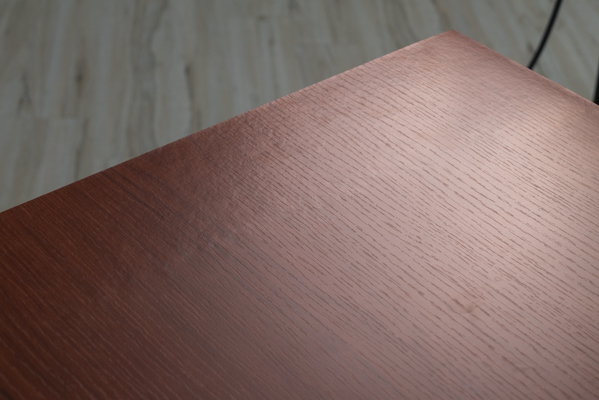 The laminate was the only surface that showed significant differences with the edge of the plate weight versus the bottom. While most of the results that we found with the surfaces were expected, there were a few surprises. The bamboo water test was the biggest surprise of all the tests. The top coat used did a great job preventing most of the water from soaking into the surface. Unfortunately, the bamboo wasn’t very strong in the durability testing. We also didn’t expect the power coat surface to absorb as much water through the actual surface coating. This is a major concern since this is the only protection across all sides of the surface. 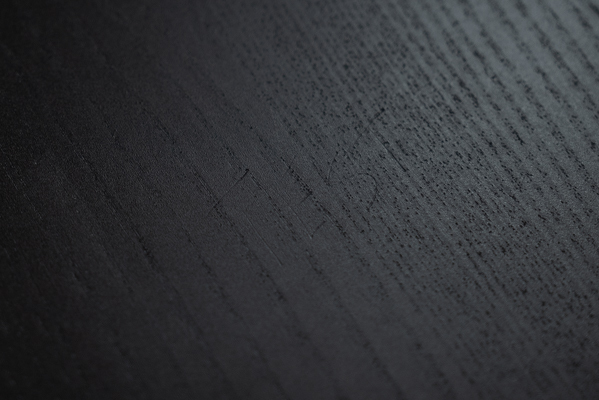 Surfaces like the thermally fused laminate have weaknesses from the edge banding, but the top and bottom of a laminate surface are waterproof. What test is important to you? 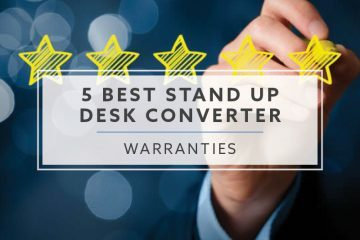 Will your desk be most susceptible to short term water damage, long term water damage, drop damage, scratching or writing damage? 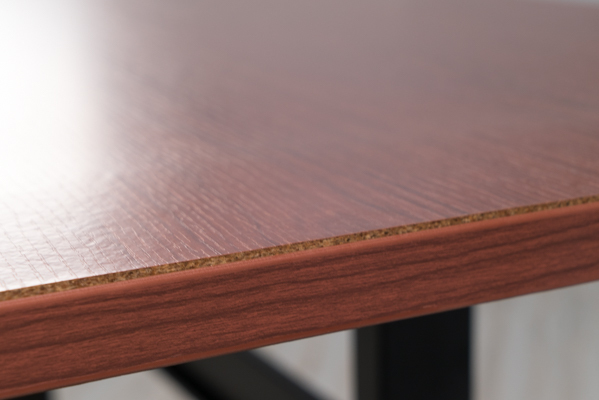 Knowing the hazards that exist in your office before purchasing a surface will reduce the damage potential that exists with certain surfaces. Armed with this knowledge, you should be able to select the best surface for your specific needs.